This easy recipe calls for basic red potatoes, cream, Italian seasoning and three delectable cheeses to create a potato casserole worthy of any special occasion. This beautiful dish is perfectly paired with chicken, pork or beef, and it's a wonderful accompaniment to homemade stews or pot roasts. We love that this dish can be prepared and cooked in under an hour, and once the cheeses are in hand, most of the ingredients can be found ready and waiting in the family pantry! Pro tip: For some added greens, fold 6 ounces of fresh baby spinach into the potatoes as you blend in the other ingredients. Preheat your oven to 400 degrees Fahrenheit. Bring a large pot of water to boil and add a dash of salt. Cut the potatoes into roughly 1-inch cubes. Place the potatoes into the boiling water for 10 to 15 minutes. Drain the potatoes and then return them to the same pan. Place the butter, garlic and the thyme in with the potatoes and heat over a low flame until the garlic is just beginning to brown. Discard sprigs of thyme. Remove the potatoes from the heat and pour in the cream, salt, pepper, pecorino-Romano cheese and blue cheese. Use the back of a fork or a masher to lightly mash the ingredients together, leaving some lumps in the potatoes if desired. Place the potatoes into the bottom of a lightly greased 3-quart casserole dish. 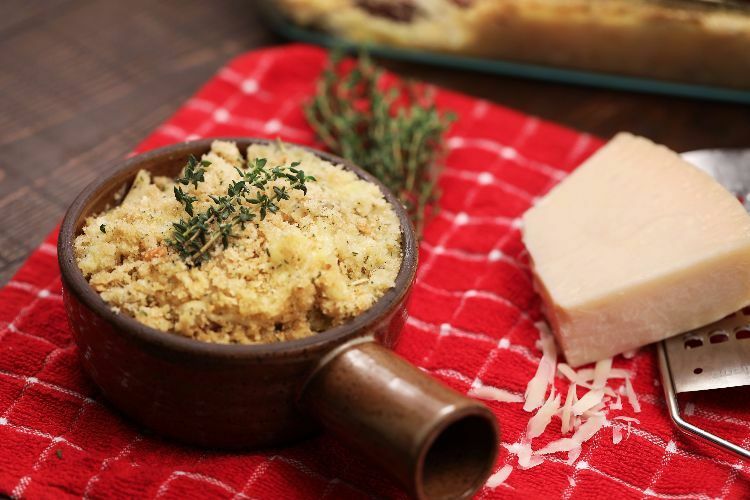 In a small bowl, combine the olive oil, breadcrumbs, Parmesan cheese, rosemary and parsley. Spoon this mixture over the potatoes and bake the casserole, uncovered, in the oven for 20 minutes. Begin by melting your butter and whisking in flour and milk. Next, add the creamy monterey jack cheese along with seasoning. I like to pre-cook the cauliflower right in the cheese sauce on the stove top. Combining all the best parts of a special meal, this easy casserole will please everyone at the table. This is a perfect weeknight indulgence. Flaky canned biscuit dough make this recipe a snap to pull together. Savory ground beef topped with melting cheese make it irresistible! How easy is this dish to make? With three simple steps, it's a no-stress creamy deliciousness! Anyone can make this delicious, Italian-inspired dish!